OH BABY! WHAT A LIFE! We all need to chronicle our daily lives in photographs, as well as words and documents. Leave a gift to future generations. But, what photographs do you take? Do you know where to start? I must confess - I don't. May 23rd, readers of Shades will get a glimpse into the photographs that are the daily life of Nikki-ann of Notes of Life. 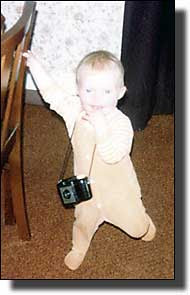 As you can see from her baby picture, Nikki-ann was born with a camera in her hands. A 20-something photographer from the hills of Mid Wales, Nikki-ann's entire blog is dedicated to documenting her life. Here we are treated to her thoughts, ramblings and rantings on various subjects including family history, photography, music, and movies. I think she is a genius with a camera. Nikki-ann has what my grandfather the photographer would call, "the gift." She sees what others don't, the extraordinary in the every day. When Nikki-ann documents her life it isn't just ten people standing in a row; it's a sense, a mood, an emotion that makes the person viewing her work feel what she is feeling. That’s something I think we would have liked to have been left by our ancestors. A sense of their daily life in photographs. The photographer gene skipped me, but I know a good photograph when I see one and I have seen so many on Notes of Life. I have been a fan of Nikki-ann's work for sometime and I think you will become a fan as well. 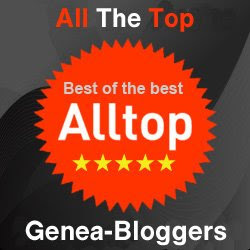 On Friday From The Collectors she will offer some very good advice to bloggers and family historians, as well as a look into the heart of some of those beautiful photographs. I'm so excited that I just can't hide it! Thank you for giving me the opportunity to take part.